The AMC13 requires at least one SFP in the bottom site (for TTC) and typically 1-3 different type SFP in the upper 3 sites for DAQ. See sketch below. 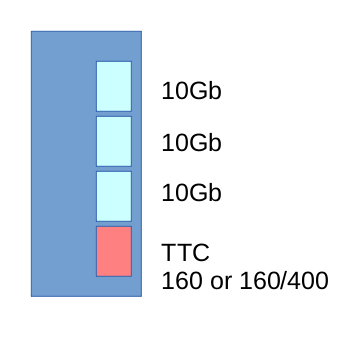 The TTC SFP for all new AMC13 should be the 400Mb/s capable type (JDSU or Finisar below). The CMS TCDS protocol now used requires 400Mb/s for the return data sent by the AMC13. The DAQ SFP currently (as of LHC Run 2 in 2015) run at 5.0Gb/s, but we plan to upgrade to 10Gb/s soon so ideally all AMC13 should have 10Gb/s capable SFP installed. For the g-2 experiment, 10Gb/s is required. Confused? Me, too! HP AJ716A 8Gb Fibre Channel SFP+ transceiver. We bought a couple from serversupply.com ($85 each or so). These are 850nm MMF Duplex LC connector type. After LS1 CMS will replace TTC hardware with TDCS. This will use TTC protocol for downstream compatible with existing system, but new 400MB/s 8b10b protocol for upstream. Either of the following two may be used. These are obsolete and should only be used for lab testing or loop-back. HFBR-57E0LZ from Avago (Digi-Key has them). We have shipped several AMC13 with the Black Box ST/LC cable (3m) P/N: EFN110-003M-STLC.